Trailers or previews might indicate that Trouble with the Curve is about a man dealing with his old age. Which I think is a very important subject that hasn't been shown or discussed in films too often. Sadly this is not the case. It was also indicated that we get high quality drama about the relation between a father and a daughter reconnecting with each other. In the most basic sense this is true. But if you ask me the real dramatic elements of them not having a close relationship felt underwhelming. This leaves us with the element baseball. It plays a too significant role that doesn't leave space for real surprises. Almost every event is predictable and never that deep enough to have a lasting effect. The romantic angle was overkill if you ask me but I guess it was important to show the viewer how disconnected Mickey (Amy Adams) was. Justin Timberlake doesn't hurt the film but doesn't really add something either. Still the acting is top notch. Which is one of the main reasons that will keep you interested. The other is that this film will make you feel good in the end. 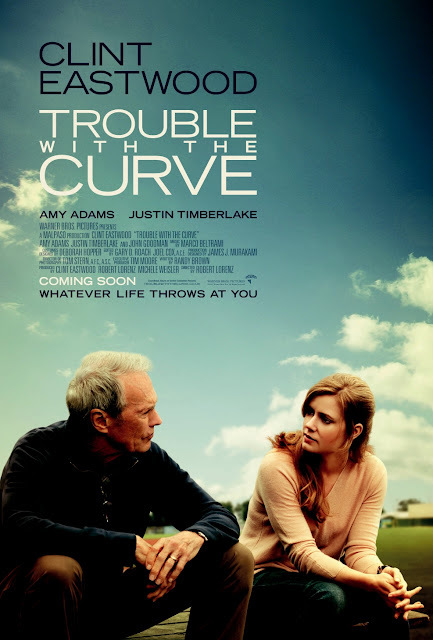 Overall Trouble with the Curve is an entertaining feel good movie but very light on actual drama.